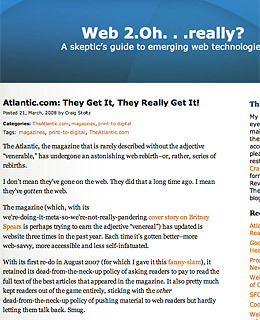 This blog is a welcome counter balance to the relentless pom pom waving of folks that cheer anything called Web 2.0. Former Washington Post editor and writer Craig Stoltz trains what appears to be a permanently cocked eyebrow on the use of 2.0 tactics in mainstream Web sites and poses a heretical question: Is this stuff useful or does it exist simply to please the boss? One of Stoltz's most widely read posts proposed that newspapers eliminate bylines on stories, as a way of embracing the collaborative news gathering spirit of New Media. The suggestion resulted in a flood of protests from  surprise  newspaper journalists, but the howls are proof that Stoltz is on to something. Few critics have the dexterity to find fault with both old and new media, while celebrating their sometimes-surprising triumphs. A recurring "2.D'oh! Round-Up" lists some of the more forehead-slapping developments in 2.0ville. Sample Web 2.Oh...really? Post: Let's start with the obvious, unpleasant truth...The renovated Web site of Harper's Magazine is inexplicably bad. From its sedimentary layers of top navigation to its 10 (count 'em) invitations to SUBSCRIBE above the fold, from its head-scratching typographical hierarchies to its rampant date tags as baffling as Sudoku, it's a freaking mess. It should have handlebars so you don't fall off.